The Charlotte Inn is a quietly elegant bastion of Edwardian splendor, even though it’s located in the middle of the busiest town on Martha’s Vineyard. Once you walk along the garden paths under the linden and chestnut trees, you just know this is a place coveted by those with a penchant for privacy and peace. When you see the picturesque lawns and gardens with grand fountains adorning the entrance, you will know you have arrived. This quiet and secluded location is just a short walk away from the livelier historic town center. 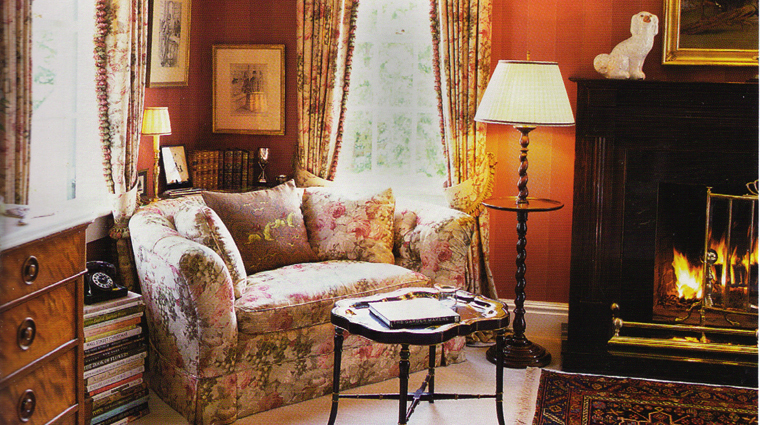 Inside, the rooms are outfitted in elegant 19th-century art and original antiques. The guestrooms continue the luxe treatment with flat-screen TVs and down pillows and comforters. The property is surrounded by immaculately landscaped lawns, shrubs, ivy and colorful flowers, and babbling fountains scattered throughout. You’ll want to follow the path through the grounds and take a seat on one of the many benches to drink in the island air. Although the dining room is just serving breakfast for now, the breakfast foods it offers are delicious and the environment is elegant. The inside dining room is beautiful, but we admit we prefer the outside patio, surrounded by ivy. 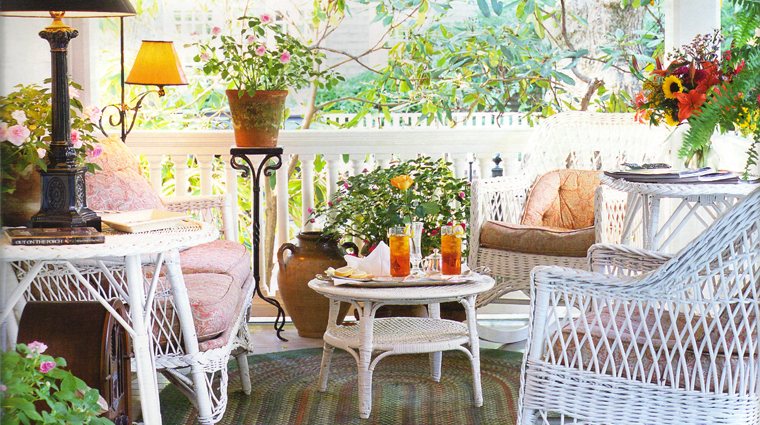 Each day between 4 and 5 p.m. on the summer house’s deck, you can unwind with a glass of iced tea or lemonade and munch on cucumber sandwiches on sourdough and chocolate chip cookies. A staff member will serve you while you mix and mingle with the other guests. After you book your room, you’ll receive a handwritten confirmation of your stay in the mail, and when you dine, they’ll just add your meal to the final hotel bill and pay for everything when you check out. You won’t sign a check until you’re heading home. Children under the age of 14 are not allowed on the property, as its focus is on giving adults a relaxing getaway, and the property’s design is better suited for adults — kids won’t find much to do here. The inn asks that you refrain from using your cell phones on the property, so you don’t disrupt other guests. 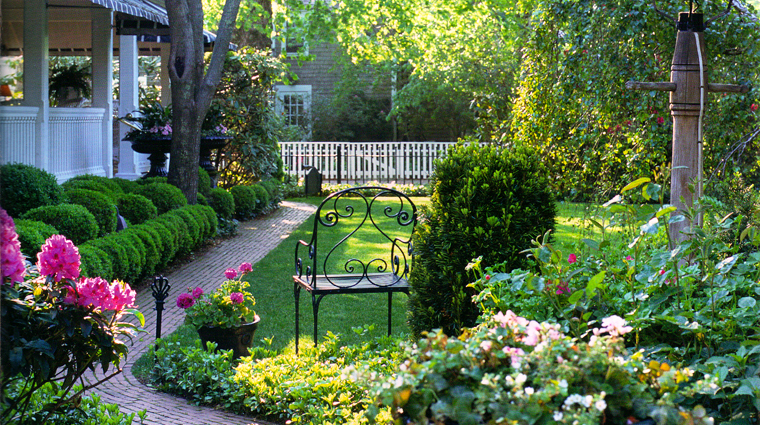 The tranquil setting of the hotel’s gardens and sitting rooms are best without cell phone noise. The inn actually doesn’t allow food in guest rooms, but there are great restaurants and cafés just about a block away from the inn on Edgartown’s main street. If you’re planning on spending some time at the beach, you’ll find beach towels in the closet of your room, and you can snag beach chairs and umbrellas from the hotel, too. Just be sure to let the front desk know that you want an umbrella, as it’s first come, first serve. Guest rooms at this Martha’s Vineyard inn are styled elegantly and classically with wallpaper and draperies featuring rich hues. You’ll find grand mirrors, four-poster beds with canopies and fine Frette linens, and all sorts of vintage pieces — beautiful antique paintings, handmade throw pillows, silver brush and mirror sets sitting on the mahogany dresser, crown molding and vintage black-and-white photos. Bathrooms are decently sized with a shower/tub, a vanity with a makeup mirror, beautiful wallpapering and crown molding. What you won’t find in The Charlotte Inn’s guest rooms is top-of-the-line technology, a mini-bar or a work desk (in most cases). There’s no mini-bar because food and beverages aren’t permitted in the well-appointed rooms. The work desk and state-of-the-art technology are omitted to allow you to truly vacation and enjoy the island. Spend your time sitting in the beautiful gardens that cover the property or wander through town’s lovely boutiques and galleries. The Charlotte Inn is on Martha’s Vineyard, which means fresh seafood restaurants are not far away — in fact, there’s a great one right inside the Four-Star inn. Il Tesoro, an authentic Italian restaurant with a focus on seafood, offers delicious food in a beautiful setting. This elegant space is complete with a breathtaking conservatory dining room that’s perfect for a romantic dinner. But for breakfast, the restaurant transforms into a bright, sunny space, making it the perfect place to wake up with a warm cup of coffee. 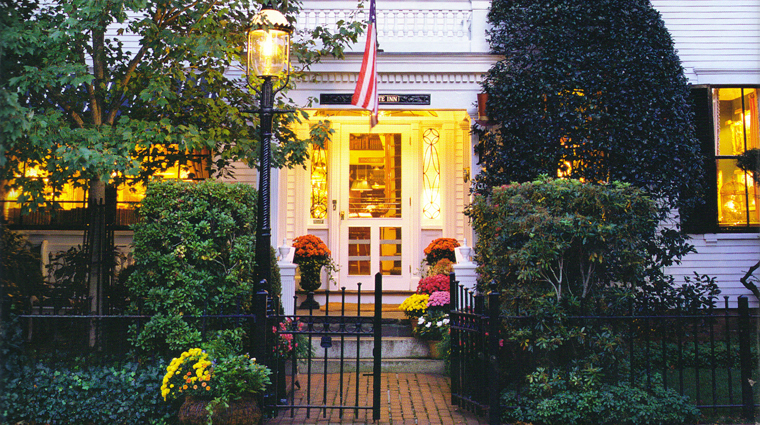 Because of the popularity of Il Tesoro, the Charlotte Inn recommends making advance reservations. Ideally, when you call to reserve your room, you should also reserve your place at Il Tesero. There are no bars located within Charlotte Inn on Martha’s Vineyard. However, you won’t have to go far to find a nice bottle of wine; the extensive wine list at Il Tesoro has you covered.